I bet you are wondering how a hosta fanatic with so much shade can grow lilies? Even though most lilies will say that they require full sun, I have not found this to be the case. I have found if they can receive 2-4 hours of sun a day they grow wonderfully. 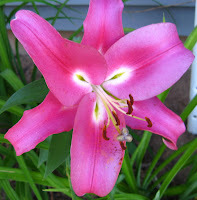 I even mix miniature lilies in with my hosta last year, and the result is wonderful. They are all Gourgeous! I think next year I will try my hand at flowers and lillys, etc! Not just veggies! Yes, I think everyone should grow lilies and hostas, of course.